In my last post, I said I was waiting for UP 5003 East to get moving and roll through Maricopa, Arizona. I was scouting for new locations on the east side of Maricopa when I stumbled across a ballast train stopped in the Arizona Grain siding. UP 4898 and 9735 were at the head of about 15 or so green UP cars. It seemed they were waiting to go east too, but obviously the stack train had priority. UP 5003 finally did get to go at 13:59. Unfortunately for the ballast train, another stack train came rolling along at 14:22 before they could get out of the siding. UP 8665, 4594 were on the head end and UP 8418, 7432 were trailing. I chased the train a bit, but they were too fast to catch up to. They were doing around 50 MPH and soon enough the speed limit on the highway went to 30. I did get a tail end shot. The ballast train finally got out at 14:43 and that was the last train for quite a while. The maintenance of way forces moved in and started doing track work, so I knew it was time for lunch. I waited around a while afterward but nothing showed up, so once the sun was down, I headed north back to Phoenix. I had some time Thursday afternoon, so I decided to head south to Maricopa, Arizona to see the Union Pacific mainline. I figured there might be a few trains there... and I was not disappointed. When I arrived at the Amtrak depot, I saw the Silver Horizon, a former California Zephyr passenger car. It is looking a little worse for wear but it is still an attractive car. I could see that Union Pacific was putting in a second track in Maricopa. The two tracks end just west of Maricopa and UP is double-tracking their entire 760-mile "Sunset Route" between Los Angeles and El Paso. Incidentally, UP has a neat factsheet about their presence in Arizona. Anyway, back to the trains. I saw an eastbound stack train pull up to the end of the double track and stop. I drove over and saw that UP 5003, 4357, and 9810 were the power on the head end. They had their headlights dimmed, so I figured there must be a westbound coming soon. I went a little west of Maricopa to try to catch it. It was hot waiting for the train! At 13:17 it came, with UP 8045, 4186, and 7838 on the head end of a manifest train, and dirty UP 4449 and UP 7877 pushing on the end. The eastbound still didn't move, meaning another westbound train was coming. I picked another location, and at 13:35 I shot UP 7380, 4263, 8606 leading another manifest train. UP 5490 was pushing on the end. "The annual Sportsplex Model Train Show is on this weekend, Saturday Nov 14 from 9am to 4:30pm and Sunday Nov 15 from 10am to 3pm. On display will be the Dartmouth Club and U.M.G. HO scale layouts, Mike's G scale layout, Errol's Z scale layout , A small G-Scale layout by Joz., Marc's O-27 Lionel U-drive layout and the very popular LEGO layout and a robotics display. Of course, a wide selection of vendors will offer new and used items. Door prize this year is a nice Athearn train set courtesy Maritime Hobbies and Crafts. Admittance: Adults $5, Kids 5-12 $2, Family $10, kids under 5 free. Hope to see you there!" traditions they cherished and a future they believed in; they died for Canada. The meaning of their sacrifice rests with our collective national consciousness; our future is their monument." - Heather Robertson, A Terrible Beauty, The Art of Canada at War. My hearts and thoughts go out to those who served, and those who serve today, especially those putting their lives in peril in Afghanistan. I went for a drive up the BNSF Phoenix subdivision Monday evening, for something to do. Grand Avenue parallels the tracks for quite some distance. I came to Surprise, AZ and noted the Ennis subdivision crossing Grand Avenue, as well as a large autorack facility with a local switcher! I pulled off Grand Avenue just after that, and noted a headlight approaching from the northwest at 18:40. I slapped the video camera on the tripod and took some video in the dark. As usual it is blurry. The manifest train had BNSF 746 and two other engines on the head end, and BNSF 7212 pushing on the rear. I went back to shoot the local switcher from across the highway. The above is the best one I took. Apparently this is a GP7. "Aeromoe" has an excellent web page on the BNSF Phoenix subdivision with an astonishing amount of detail. I wish I had found this sooner! This was quite a lashup. Shiny CP 5405 was on the point, with worn SOO 6616 in the middle and MLW M-636 CP 4701 trailing. Note the lack of a multimark on 5405, compared to the "Pacman" on 4701. I always liked the white SOO paint scheme. The slide was taken in London, Ontario by David T Stowe. 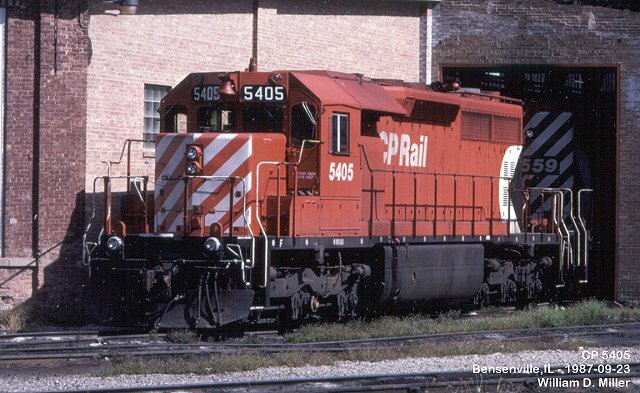 CP 5405 was an SD40 built as QNSL 209 for the Quebec, North Shore & Labrador railway in 1971. She was leased to CP in 1983 and purchased in 1985. This photo shows her in September 1987 with a multimark, so sometime between then and November 1990 she was repainted and lost the multimark. CP Roster. SOO 6616 was built in March 1981 as an SD40-2. Sometime between 1986 and 1991, she was repainted into a different scheme, the red SOO scheme with white stripes (see here). As of 2003 she was still operating. CP 4701 was built in 1969 by the Montreal Locomotive Works (MLW) and was an M-636. Some of you may remember the proposed Acadian Railway, to run across the Acadian Peninsula in New Brunswick following a similar route to the old CN Caraquet subdivision. There was a flurry of news articles in 2007 but not much has happened in the past few years. A new industry for Caraquet, announced this month, may change that. Peter Swire, promoter of the Acadian Railway, is also the president of the GreenSafe Demanufacturing plant. CBC is reporting that construction should start by the end of November 2009 and the plant should be up and running by the end of 2010. The plant will take old appliances and recover all of the components, including the refrigerant. The tie-in to the proposed Acadian Railway is that the plant is anticipated to receive at least 40 truckloads of appliances per day. The alternative to this is to construct a railway to bring those items in, and presumably ship the recovered components out. Peter sent me a copy of the press release last week. I should point out that CBC got the funding amount wrong by a factor of 1,000... the private investor has put $50 million into the project, not $50,000. Press release (PDF). EDIT: Peter pointed out that the plant is to be built in Caraquet, not Tracadie as I originally posted. Thanks for the correction. I'm in Phoenix, Arizona this week, and I had a little time this afternoon / evening to have a look around. Bill Linley kindly gave me the October 2009 Railroads Illustrated magazine that featured an article on BNSF in Phoenix - very timely! I went looking for their Mobest yard in Phoenix just south of I-10. I drove around for quite a bit, following various bits of track, before I stumbled across it in the rapidly falling dark. It is not very accessible for photography but I did what I could to identify the units there. There were about 8 or 9 Geeps there plus a couple of pairs of road units. I positively identified these units: BNSF 2843, BNSF 2648, BNSF 2829, BNSF 2945, BNSF 2958, and BNSF 7577. I don't know how much spare time I will have this week, so I may not see any more trains here. I'm glad I got a glimpse of them! On my way from Moncton to Halifax airport on Friday, I decided to stop and shoot VIA 14, the eastbound Ocean, at Amherst. I had thought about Aulac, but the pouring rain dissuaded me from that. I set up at Amherst across from the station and waited. At 13:07 VIA 6400 and 6424 rolled up to the station, towing a Renaissance train. The complete consist was VIA 6400, 6424, 7011, 7223, 7230, 7312, 7402, 7308, 7509, 7501, 7525, and 7512. After dealing with the passengers, the Ocean backed up out of sight around the corner. Soon enough, they crawled up the siding past the station and went up to the east end of the siding to wait for CN 407. Here they are just after they passed the station. I relocated to get a shot of the Ocean meeting CN 407. At 13:33 CN 2519 appeared on the main line and rolled past the impatient VIA train. CN 2680 was the second unit on 407. You can see the Ocean to the right in this shot. I saw 2519 in Winnipeg on August 16 of this year. Oddly enough, it was raining then too. I didn't have time to look for VIA 15. No doubt they met VIA 14 somewhere like Folly Lake rather than the usual Belmont siding outside Truro. CN 120 was late Thursday morning, which gave me the chance to see it. I was traveling from Halifax to Moncton early in the morning and I caught it at Aulac, NB. I didn't have much time to set up so I wasn't able to pan the video camera to follow it, for fear of a very tilted horizon. I did grab a few stills as it went by at 07:27. The power was old friend CN 5756, 2534, 2595, 5675, and GP9 7031. "Nice clear shot of NBEC 1867 on your blog today. Here is a view of CAR Extra 1867 North, on the Gibson Sub, Feb. 08, 1992, with 20 cars.......6 tank, 4 box, 1 covered hopper, 9 reefers..........at 2:30 pm, snowing at the time. RS-23 8042 was running mate to 1867. 1867 made four additional trips over the Gibson, my last recorded one being Feb.14, 1992. In fact, I sighted no more RS-18's, as RS-23's became the regular road power, to the end of service, Nov. 1993. Thus, 1867, according to my extensive log book entries, was the last RS-18 to operate over the Gibson Sub." CP 1867 was built as CP 8765 in April 1958 with a high hood. It was rebuilt by CP and renumbered to 1867 in 1989. It was sold to the New Brunswick East Coast Railway in April 1998. There are only two photos of NBEC 1867 on RailPictures, one of mine and one B&W photo by Pat Schmidt. There are no photos of CP 1867 on RailPictures at all, and all the photos of CP 8765 on RailPictures are of the shiny new ES44AC. I personally saw NBEC 1867 on 17 different days. It was an active unit in the NBEC fleet. 51 years old.. now off to be scrapped. Sigh. David Morris sent along a few photos of the Orford Express, the tourist line that runs between Sherbrooke and Eastman in Quebec. They travel on the MM&A's Sherbrooke subdivision. I posted about their startup back in early 2006. The Orford Express has one engine on its roster, #26 an MLW M-420TR built in 1972 (photo). As you can see from the photos, they also have two RDCs, specifically RDC-1 units 6121 Elyse and 6125 Thompson (ex-CN RDC-3 D100 and CP RDC-2 9199). They have a single dome car #310, originally built in 1954 as Northern Pacific 310. They seem to aim for the dinner train crowd, and the photos on their web site sure look tempting. NBEC 1867 in Miramichi, NB on September 14, 2004. Canadian Railway Observations is reporting that ex-CFMG SD40 units 6902, 6903, and 6906-6910, as well as RS-18s ex-OCRR 1838, ex-NBEC 1857 and 1867 are all going to Alabama to be parted out and scrapped. The last time I saw 1867 was on November 7, 2006 in Miramichi, in the middle of our War Bride train chase. By the way, if you haven't read Canadian Railway Observations yet, you should really check it out. I'm in Halifax for the week, my first trip back to the right coast since I moved to Winnipeg this summer. After my plane landed on Sunday (November 1), I drove into the city and found myself driving to the CN Rockingham yard. Imagine that. I saw a few units at the yard office, notably including CN 9639 and the two-car TEST train. I shot this in the fading light around 5 PM. The TEST train is CN's Track Evaluation SysTem, which does exactly what it says. They run it along the line and it reports defects in the rails. Geoff Doane reported that it came into Halifax today as CN train 482. They ran out to Autoport on the end of the Dartmouth subdivision, then backed up to Windsor Junction, then ran to the end of the Bedford subdivision at Halterm (HOT) by the VIA station and turned on the loop track there, before testing the transfer track to Millview and backing to Rockingham. I took video as it left at 18:50 but I'm not sure how well it will turn out. Night video is tricky and I wasn't really ready. Also in the yard were CN 4805 and 4725, power for the locals. At about 19:00 the power for CN 121 came up from Fairview, with CN 5710, CN 5296, CN 2249 and CN 5609. It was too dark to take photos by that time. I didn't hang around, since I had not had supper yet and I had to check in. I did chat with a couple of AtlanticRails members, Bruce and Doug, before heading out. I don't know how much time I will have for railfanning while in Halifax... we'll see. I was running errands on Thursday (Oct 29) and I heard that the Greater Winnipeg Water District Railway (GWWD) might be out and about. I found GWWD 200 switching tank cars outside their yard on Dawson Road in the rain. Once they put their tank cars away, they ran up to a switch to get ready to head to the yard. Then they crossed Dawson Road to enter the GWWD yard in St. Boniface. Despite the rain, I was pleased to see a GWWD unit moving!